This 925 silver jade pendant has an interesting story behind it. The concept is based on a century old design carved on a very old wooden door. The fact is that, old classic designs like this pendant, never seem to go out of fashion. At the same time, modern contemporary styles seem to have a rather short shelf life. The green jade pendant shown here in silver can also be custom made in yellow or white gold. The increase in gold prices has been a one way road, a significant number of gold jewelry buyers have moved to silver options. What is sad however is the fact that, the fine silver jewelry expected of these ex-gold jewelry buyers is in very short supply. 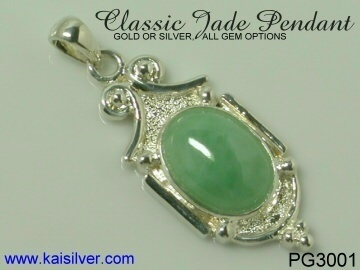 The PG3001 sterling silver jade pendant, is aimed at those quality concious buyers. While we will gladly craft this jade pendant in silver or gold for you, the quality of gem and craftsmanship will remain the same for both metal options. Jade is a stone that has been known to man for many thousand years. An interesting thing about jade is that, the initial applications to which it was put did not relate to jewelry at all. Jade by nature is made up of numerous fibres meshed into each other, this actually adds to the toughness of the stone. Man realized this and used the stone to make weapons and tools. The price of jade has today raised it to the level of a gemstone used in fine jewelry. And along with this introduction into the world of gemstones, came a host of folklore and traditional beliefs. The sheer beauty and grace of this 925 silver jade pendant makes it highly desirable, a significant portion of the demand would be generated by this. At the same time, a large number of buyers would like to wear this jade pendant because of the, special significance that the gem has for them. An antique style jade pendant, with a large oval jade gemstone. This gold or 925 silver jade pendant has fine craftsmanship for the gold or silver metal options. A range of gemstone options have also been provided. When making jade jewelry there gem price is an important factor that every jeweler has to consider. Fine jade, in sizes beyond 8mm with a uniform green color are highly prized gems. A natural jade that has not been treated in any way, with a beauty that matches the jade in the PG3001 pendant, could cost as much as 1,000 U.S$ in the retail markets. Given the very large demand base for jade, this price would have fit the budget of a tiny minority. For this reason, natural jade is very often dyed to improve it's color. This might seem strange but, gemstone treatments to enhance gem beauty are widely accepted. For example, a 5,000 U.S$ octogonal blue sapphire that weighs about 5 to 6 carats, would almost surely have been heat treated to improve it's color. The same is true for rubies too, more than 90% of the rubies and sapphires used in jewelry are treated to enhance their beauty. Another good example is emerald, even the finest emeralds securely preserved in museums are treated with natural oils to improve their transparency and lustre. The important thing to remember is that, all these gems are natural and have been mined from the earth. The treatment is done to make them appear better or make them tougher. We have shown the 925 silver jade pendant with a green jade gemstone, other jade colors could include lavendar (light purple) and yellow. Keep in mind that all these jade gems are dyed to enhance their color. The term jade as defined by gem experts includes both nephrite and jadeite. If you need a gold or silver jade gemstone pendant with an untreated jade gem, nephrite is a good option. This jade variety has a dark green color, and can show some interesting lighter green patches too. We have often stated that, the need for an untreated gem is generally influenced by some special significance that the stone has for the buyer - beauty and apperance are not so important in such cases. Now an interesting and important thing about, gems touching the skin. The demand for gems from buyers who believe in various gemstone traditions and powers is considerable. One often requested feature from these buyers is for the gemstone in the jewel to touch the skin, this could for pendants or even for rings. Here is what we would suggest if you would like the gem, in your jade silver pendant to touch the skin when the pendant is worn. The jade gemstone as you can see in the image, is a smooth cabachon cut oval gemstone. We could mount two of these gems, back to back in the 925 silver pendant. The gem on the back side would touch the skin and the fact that, the gemstone is rounded and not pointed or faceted will ensure that the skin does not get scratched or irritated. In the standard version of the 925 sterling silver jade gemstone pendant, we have closed the back of the pendant with metal. So if you need the jade gemstone to touch the skin from behind, do request specifically for it and we can have it done. There might be a slight increase in price for the second gem that needs to be mounted at the back. A unique feature of all our jewelry is that, every jewel can be ordered in gold or 925 silver with the gemstone of your choice. When it comes to large gem sizes as seen in the jade silver pendant, the econimics of gem pricing make some gems irrelevant. For example, a natural ruby, sapphire, emerald or tanzanite gem of this size would be priced well over 3,000 U.S$ for the gem alone. This is the only reason why you might not find some gem options in the pricing tables for the jade pendant concept. Another aspect for the gem choice is the decision to get a faceted or cabachon (smooth) cutting style for the gem. The image you see for the 925 silver jade pendant, shows the pendant with a smooth cabachon cut green jade. Given the overall antique style of the jewel, a cabachon cut looks most impressive. 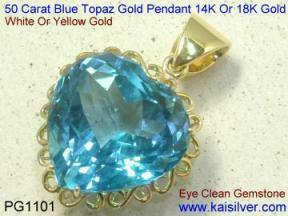 You can discuss, the possibility of getting a faceted gem for your gold or silver pendant at the time of ordering. Silver Weight. 10 to 12 grams. Gold Color. Yellow or White Gold. 14k or 18k, white or yellow gold. 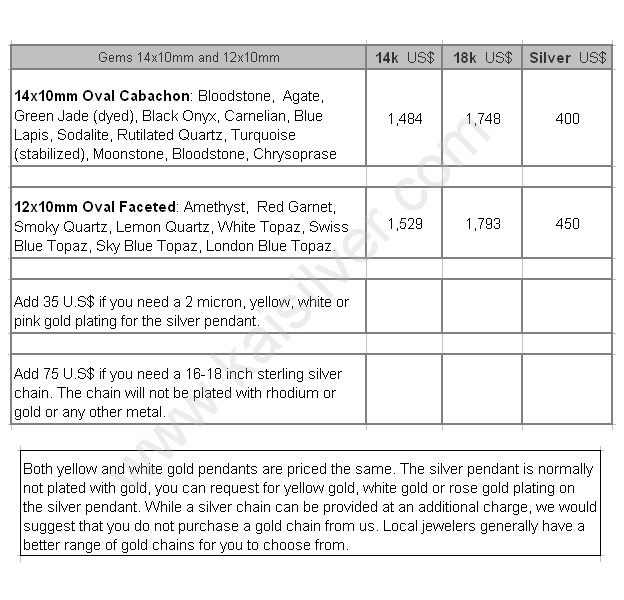 Gem Options See Price Table Below. Gemstone Size Oval 14x10mm / Oval 12x10mm (refer to table below). Chain Not Included Add 75 U.S$ For 16 inch or 18 inch silver chain. The beauty of jade is enough to draw the attention of even a casual jewelry and gem buyer but, there is more to this gem. Since jade like many other gems, has been known for a very long time, traditions and beliefs related to the stone are many. A substantial demand for jade pendants and other jade jewelry relates to buyers who believe in traditions. Closely related to this demand is an often made request - buyers wish to have a jade jewel where the gem actually touches the skin. The belief that the 'powers' of a gem are enhanced if it is worn with direct contact to the skin, are quite strong. While we do not make any claims of special powers for any gems that we sell, we can fulfill requests for the jade in your pendant to touch the skin. To make such a jade pendant, two jade gems are mounted back to back, the gem on the portion behind the pendant would then touch the skin. This might cost you a bit more than the conventional design with a single gem, but it is an attractive option for those who respect traditional beliefs. 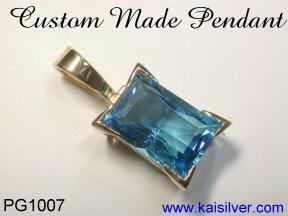 Just keep in mind that every Kaisilver jewel is fully custom made. What you see on this web page is just one of the ways in which this jewel can be designed and produced. Our support team at sales@kaisilver.com is ready to help you with just about any type of customization that you would like to include in your gold or silver pendant. You are ofcourse welcome to send us your own designs, we will gladly custom make them for you in gold or silver with the metal, dimensions and gems of your choice. If you need the gemstone to touch the skin from the back side of the pendant, there would be an additional charge as this involves mounting two gems back to back - for the gems mentioned in the first category above. Please add another 50 U.S$ for the additional stone. For the second category of gems, they are faceted and the back portion can be made to touch the skin, you therefore need not pay any additional charges for the gems in the this category. Kaisilver is the world's leading online highend custom jewelry provider. We believed and proved to the world that it is possible to provide fully customized jewelry through online transactions. Backed by a team that includes some of the best designers, gem experts and production executives, we today have a customer based that spreads over 17 nations and more than 10,000 gem and jewelry lovers. Over 3,500 skilled craftsmen and gem cutters work on all Kaisilver jewelry orders. They are inspired by the talent of 7 top notch designers drawn from 7 nations. When it comes to gemstones, our sourcing from the world's leading mining and manufacturing operations gives us preferential access to over 250 million carats of gems. We can therefore provide all jewelry in gold or sterling silver with gems of your choice. Our policy has always been based on a strict no gimmicks attitude. While avoiding marketing hype and high pitched product launches, we rely entirely on customer satisfaction to stay in business and progress into the future. By providing honest and straightforward suggestions and advice, we educate buyers enabling them to make well informed decisions. We have never encouraged the concept of pushing buyers to make an impulse buying commitment. Our Jewelry Newsletter is respected as one of the most informative and fair online publication related to gems and jewelry. We are the only online jeweler to maintaina dedicated online resource related to Online security. The information from the online security resource is relevant to net users and also online buyers and sellers. The information is provided in the public interest and made available to everyone without any charges or registration. Kaisilver buyers include, fashion models, news readers, doctors and surgeons, government officials, members of the armed forces, sportsmen, lawyers, financial experts, students and professors, resort and casino owners, housewives and others. Most online buyers are used to seeing websites where the emphasis is on making a quick purchase. We have avoided 'Buy Now' and other such pushy sales tactics. We prefer visitors to our website to look around and interact with our support team, our expertise is available with no buying commitments from you. So do email us your queries and requirements at sales@kaisilver.com You can include item numbers or send us images and sketches of your favorite designs. Also let us know whether you require gold or silver jewelry. All the jewelry that you see on our website, and any other designs and sketches that you provide can be custom made in gold or sterling silver. You will get the same quality of designs, gemstones and worksmanship for gold and silver jewelry. We show our commitment to this by using the same designing and production team for all metal options. When it comes to payment, we prefer to accept Paypal, this mode of payment has been found to be safe for both buyers and sellers. You can register for a Paypal account at no extra charge by visiting their website at www.paypal.com We do accept bank transfers and Western Union transfers, request for information if you prefer to use one of these. Please note that we will accept such payments only if we feel comfortable and secure about the transaction. In todays online markets, the buyer and seller are at equal risk when it comes to financial dealings. 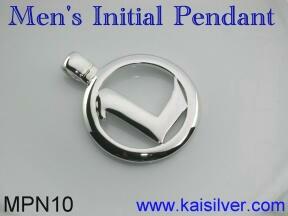 Our email for Paypal is info@kaisilver.com and we are International Verified Premium Account holders with Paypal. This will ensure that you can confidently deal with us from anywhere on this globe. Shipping is through FEDEX and your jewel will ship within 4 to 5 weeks of order confirmation and receipt of Payment. This is because, each jewel is completely made to order and every gem is carefully picked and assorted before being custom cut. While this does sound like a time consuming process, there has never been any faster way developed to produce highend customized jewelry. If you need your jewel for any specific occassion like a wedding or engagement, we would suggest that you start the search and evaluation process well in advance. If you are on a very tight time frame and need jewelry at short notice, please look for another jeweler. We believe that hurrying production can only happen with a compromise on quality, and we are not willing to do that. London Bue Topaz Pendant ... details. Blue Topaz Heart Pendant ... details. All Information And Content On This Website Is Protected By International Copyright Laws.